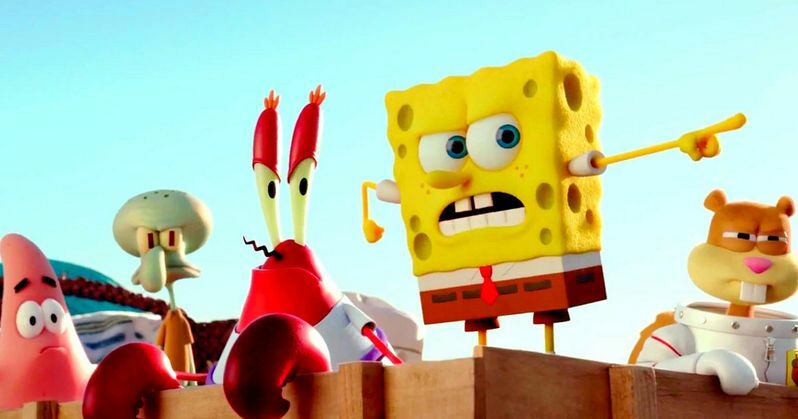 Spongebob (Tom Kenny), Patrick (Bill Fagerbakke) and the rest of their friends from Bikini Bottom go on a quest for Krabby Patties in the first clip from The Spongebob Movie: Sponge Out of Water. This live-action/3D animation hybrid takes Spongebob up to our world, where he goes on a quest to retrieve a stolen recipe, and ends up tangling with a pirate. As you can see in this clip, Spongebob and his friends aren't quite ready for this world, as they team up to take a joy ride with a bicycle, which confuses everyone on the beach. Antonio Banderas lends his voice to the nefarious pirate Burger-Beard, with Clancy Brown (Mr. Krabs), Rodger Bumpass (Squidward Tentacles), Mr. Lawrence (Plankton) and Carolyn Lawrence (Sandy Cheeks) reprising their roles from the SpongeBob SquarePants TV series. Paul Tibbitt (The SpongeBob SquarePants Movie) directs the animation portion of this hybrid comedy adventure, with Mike Mitchell (Penguins of Madagascar) directing the live-action segments. Take a look at this new scene from The Spongebob Movie: Sponge Out of Water to see how these animated characters adapt to this strange world. The comedy adventure arrives in theaters February 6, so be sure to stay tuned for more footage as we get closer to the release date.